I can't imagine when they started in Cardiff in 1978 that Young Marble Giants ever thought they would be playing at a conference named after a Billy Idol song or a festival named after a Velvet Underground song. Or at a Butlins holiday park. But, as their reunion gig in 2007 was at a book festival, perhaps these appearances are not out of character for the post-punk minimalist legends. After an exile of some decades, YMG have re-emerged, sort of. Dates are sporadic. Gigs are low-key. New material is absent. This is how they want it. Meeting the band backstage before their gig at Berlin's Dancing With Myself conference in January, I asked about the reunion and their plans. Present were the usual suspects: singer Alison Statton, guitarist/organist Stuart Moxham, bassist Philip Moxham, plus the new face at the back, another Moxham brother, Andrew, who has taken over from their home-made drum machine. While things were a bit tense when they broke up on tour in the U.S.A. back in 1980, this new, older, wiser incarnation is full of banter and cheer and taking it all in their stride. With the benefit of hindsight, they can now look at their teenaged selves and compare and contrast. Things are a bit more relaxed now, all agree. Alison said: "In one sense it feels as if we never stopped playing and we're just a few months on, but in another way I feel much more relaxed about it all now than I did then. Less self-critical and just appreciating the music for what it is more, because we've had that time and that separation, so hearing it maybe closer to the way other people hear it now rather than hearing it as the person involved in the performance." Sitting next to her, Stuart murmured in agreement. The band weren't always so keen on performing. Cardiff's music scene was dominated by hard rock and blues bands, and the audiences they played to early on were not always taken with the delicate minimalism of the Giants. Philip admitted, "It was terrifying. And also, as the music was so diverse, I always felt-- I knew it was OK. But, we used sometimes to get quite extreme reactions. Some people really didn't like it, you know. There's no distortion, there was no thrashing, there was no punky element. The punky element is that it was so radical for the times." Stuart interjected, "Like a lot of other bands at the time, we didn't have any mental shackles. We just felt that anyone could do it, after punk and that you could try and do really ambitious things, hugely ambitious things. People either love it or they hate it and from our point of view, playing it, it was almost feeling apologetic because there's nothing to hide behind. Like Phil said, there's no distortion, no volume. It was difficult to be really quiet." The 2007 re-issue of their lone album, Colossal Youth, originally out in 1980, brought the band renewed attention. Having played their first gig in years at that year's Hay-on-Wye book festival, they have made sporadic, invite-only appearances ever since. As the videos posted by the band of the Berlin gig attest, they are not the tightest of live acts. Alison forgot the lyrics to "Eating Noddemix," while Philip and Stuart flubbed a few notes. And yet the audience was entranced, singing along to "Wurlitzer Jukebox!" and applauding wildly. 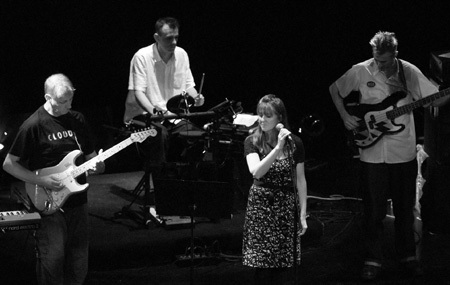 Young Marble Giants were never about extravagant light shows or stagecraft. The emotion of the music and the very stillness of the musicians alienate some while drawing others in. Perhaps this is why the reviews of their All Tomorrow's Parties performance, where they played Colossal Youth in full, were so tepid: they aren't a hands-in-the-air festival band. That album remains their touchstone, but there were plans to record new material. Munching a macadamia nut, Stuart explained: "We originally thought it would be a good idea to try and do another album. Yeah, we thought it would be a nice idea to do that. We said, 'Whatever we do, we won't just do the old music. We won't come back and be an '80s comeback band.' But, as it happens, that is what we're doing." He chuckled, paused and added, "It's good fun, actually." So, what's happening with new material? "Nothing," said Stuart. "We have no time. We all have jobs and kids. That is a body of work that works well and we don't want to lessen it." He then added, contradictorily, "I think we could do it." Philip added, "Just organising it." This suggests perhaps that not all members are on board for the project. Stuart, however, continues to write new material, some of which may be debuted at a gig by his other band, The Gist, which will appear at The Big Chill Festival in the UK on August 7. Playing with a five-piece, including Andrew and long-time collaborator Louis-Philippe, the set will encompass material from The Gist and another side project, Stuart Moxham and the Original Artists, some of it unrecorded. Stuart also plans to compile a new album of material he found while sorting through old tapes. So, no new Young Marble Giants material--for now--and no gigs outside of Western Europe. But, for this most self-effacing of bands, there is a chance to reflect on their achievements. Philip remains impressed by the response to Colossal Youth. "People who have been listening to it for the last 30 years or so have said they are quite pleased to see us playing. 'Cause they might have bought the record, and we only ever did a year's worth of gigs then. Plus, there are a lot of younger people who are into the band, as well, it seems. I was gobsmacked, really, 'cause every gig we do, people come up and say 'Oh, god, I've been waiting for this for 30 years', which is remarkable, really."